Born in Argentina, Marisa Gómez began studying the guitar at the age of six. 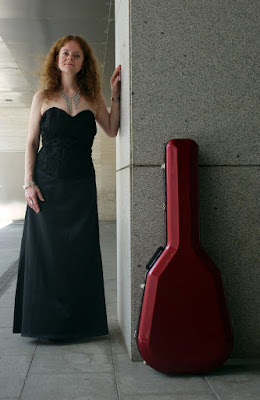 She holds degrees from the Quilmes Conservatory (Argentine) and the Royal Conservatory of music in Madrid (Spain). She also studied violoncello and orchestral conducting at the University of La Plata. Other notable teachers include David Russell, Manuel Barrueco, Eduardo Fernández, Konrad Junghänel, Leo Brouwer and especially the great maestro Eduardo Isaac. A particular interest in contemporary music has led to several world premieres. She is a remarkable exponent of tango and other Latin dance music, reflected in her six CDs: Three solo guitar albums (one sponsored by UNESCO) and three with different chamber music groups. Her numerous recital appearances include performances across Latin America, Asia and Europe, in countries like: China, Italy, Portugal, Argentine, Brazil, Chile, Uruguay, Mexico, Germany and Spain. Currently, she is professor at the "Conservatorio Superior de Música de Castilla y León" in Salamanca, Spain and is frequently invited to perform and give master classes at major festivals, music seminars and at prestigious universities worldwide. She lives in Spain since 2003.